The Ritz-Carlton Powerscourt in county Wicklow, Ireland, is a 200 room Georgian Style manor house built on the grounds of the historical 1,000 acre Powerscourt Estate near Dublin. This luxurious sanctuary for the senses, has oversized rooms, lavish suites, two 18 holes championship golf courses, a Gordon Ramsay signature restaurant, a 33,000 square foot ESPA, and a staff of “ladies and gentlemen serving ladies and gentlemen". An invite to experience the first 100% authentic Irish Og Peat Ritual takes me on an unforgettable odyssey that begins in Dublin. 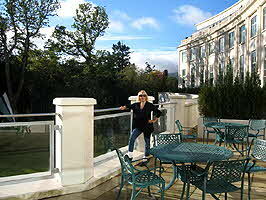 After a day of sightseeing, I spend the night at The Merrion Hotel, a member of the Leading Hotels of the World. The next afternoon the Ritz-Carlton sends a car and driver to fetch me; it is a forty five minute drive from the city to the Powerscourt property. From the moment we enter the gates, of one of the most scenic estates in Ireland, I am transported back in time: to the .days when land barons ruled their fiefdoms... to a place of tranquility and serenity... where rivers and waterfalls flow … mountains rise in the distance… three hundred year old trees shade the lanes … and docile horses roam the fields, happy to make friends for cubes of sugar, apples or carrots. 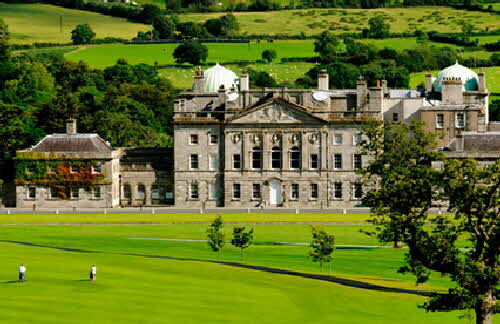 The Ritz-Carlton Powerscourt, with its neo-classic Palladian exterior and Georgian inspired interior, has the right to boast about having some of the largest hotel rooms in Ireland. My two bath suite with a private forty foot terrace is opulent as well as huge. There’s even a television screen in the middle of my bathroom mirror (I watch the news while brushing my teeth) and one mirrored square set into the tiles of my oversized shower (great for washing off eye-makeup). 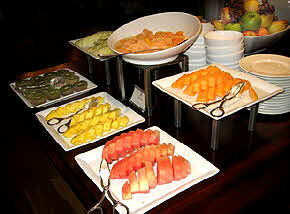 I begin my days at the bountiful Irish Breakfast buffet, a celebration of local products nature generously provides. The sun is warm and undaunted by the gray clouds that float by. I carry my plate, piled with smoked salmon, local fruits, fresh baked breads, eggs, grilled mushrooms and tomatoes out to the restaurant terrace. I savor my food and the moment; it is a glorious day, and I feel blessed to be here. 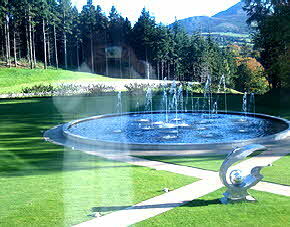 The hotel with its 30,000 square foot ESPA and Wellness Center is nestled within the awe inspiring County Wicklow Mountain range, and looks out on Sugar Loaf Mountain Peak. The spa has an impressive menu of cutting edge beauty treatments and traditional wellness rituals that include: Chinese acupuncture, Indian influenced Ayurvedic therapies, Balinese infused massages ... and a wide array of state of the art thermal suites. Their unique signature treatments include: the “Garden of Inspiration Body Ritual and Garden of Inspiration Botanical Facial Ritual, both age – lifting and stress releasing experiences. I arrive at the spa two hours before my Signature Peat Ritual to allow time to experience the hot and cold plunge pools and steam rooms. After changing into a robe, I enter the hammam; and stretch out on a marble ledge. As the steam rises, the heat intensifies; I feel my body releasing toxins and the stress of my travels. Outside the hammam, I douse myself with buckets of icy water to close my pores, and then wander in and out of crystal steam rooms, tepidariums, oversized rainfall showers, saunas and vitality pools. 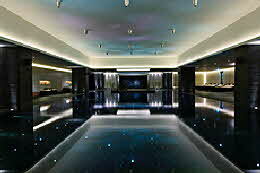 I swim laps in the Swarovski crystals–lit pool, and doze in a curved heated chair in the Serenity Room. I am even served a delicious lunch in the spa dining area. I retreat into the ESPA; it is a nurturing escape into extra sensory experiences with soft music, mood enhancing fiber optics, and the gentle aroma of essential oils that are infused into the air. When it is time for my Natural Peat Ritual, Glenda, my spa therapist, leads me to a special treatment room. Natural Peat has been used in skin care for generations. The rejuvenating benefits come from the abundance of essential oils, fatty acids and lipoids in peat. They penetrate the skin, re-establishing the natural pH balance and stimulating blood flow. Healing properties in the moor peat replace harmful positive ions in the skin tissues. These soluble natural active ingredients are suitable and beneficial for even the most sensitive skin. I am told this ultimate Warming Peat Body Wrap, made with 100% Og Ireland Peat, is the ultimate way to hydrate and condition winter skin, and even though winter has yet to set in, my sun dried skin can use the therapeutic benefits. 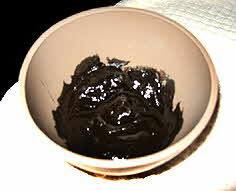 The peat, rich in water, magnesium, manganese, iron, zinc and copper (all skin healing properties) is also good for acne. I learn that peat improves the skin’s elasticity and is an ideal anti-aging retardant. The peat helps to increase blood and lymph circulation thus helping to reduce cellulite plus anti-inflammatory properties that are excellent in treating arthritis. My Signature Peat treatment begins with a salt and oil scrub. Glenda uses a mix of grapefruit, lemon, peppermint and menthol. to detoxify, relax and invigorate my body As the muscle warming oils penetrate my skin, preparing it for the peat application, I feel my body responding with gratitude.. I shower and stretch out on the therapy table; Glenda a senior therapist who helped develop the three step ritual, warms the peat and then gently applies it to the front and back of my body and on my face. She wraps me in a heated cocoon. While the peat is working its therapeutic magic, Glenda gently manipulates my head and kneads my scalp. When the peat is ready to be removed, I stand under a warm shower, and with the help of a terry wash matt, scrub off the dry peat. The final treat is a deep tissue massage with a mix of wheat germ oil and vitamin E which she tells me: “makes it easier for stretching” . . . West Indian bay and cinnamon for detoxifying . . . juniper berry, cypress grapefruit oils and eucalyptus for toning . . . and grapefruit, lemon, peppermint and menthol for invigorating. Glenda shares a Spa Tip from her grandmother: Finely grate a potato, place in gauze and place under your eyes and on your face; it will reduce puffiness and brighten a sallow completion. The ESPA staff has been well trained in the art of pampering and pleasing. My days of imperial indulgence leave me looking and feeling 10 years younger. A car is waiting to take me to the airport for my flight back to reality. The hotel has thoughtfully packed breakfast.” Brilliant” is a word often used in Ireland, and brilliant is a word that best describes my time here at this amazing property. Once again, yet another Ritz-Carlton treats me like royalty ... and as their very special guest. They excel at their philosophy “we are a staff of ladies and gentlemen serving ladies and gentlemen” . . . and serve they did. Imperial indulgence was the order of the day ... and my very special stay. © January 2011 LuxuryWeb Magazine. All rights reserved.